Luxury watches are rarely discounted, and if they are discounted then it's not by very much. 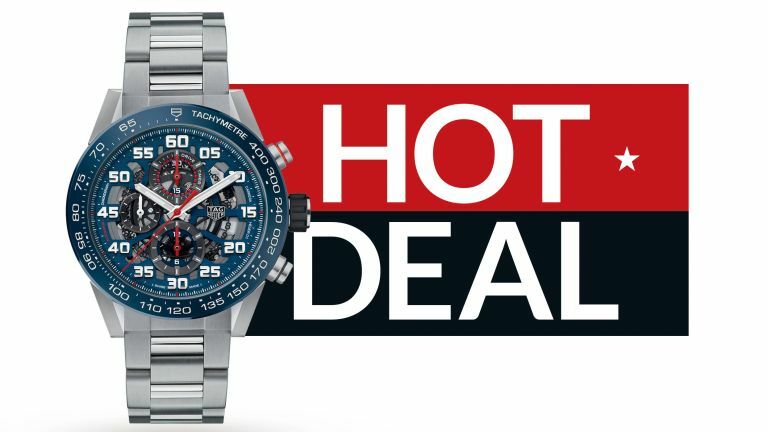 That's why this saving of £1000 on a TAG Heuer Carrera is not to be missed. TAG Heuer is one of the world's leading watch brands, and its modern Carrera range is bold, innovative, and as aesthetically stunning as they are highly functional. The watch in questions features a 45mm steel case, water resistant to 100 meters, with sapphire crystal protecting the brilliant blue dial. It comes on a stainless steel bracelet comes which is designed for ultimate comfort, but it can but swapped with a leather or rubber strap, if that's more your thing. Under the skeleton dial is the beating heart of the Heuer 01 automatic movement. This has a power reserve of 50 hours, and is C.O.S.C. certified. This saving is not to be missed, if you're in the market for a new luxury timepiece, now is the time to buy. If you can't afford the initial outlay, Goldsmiths also offer the option to pay from £70.84 per month, with 9.9-percent APR.